Canal Square is a 30 story mixed-use urban redevelopment. The building consists of a residential high-rise, surrounded by a four story building with commercial, residential and parking facilities. The first four stories of the building are designed to blend with the surrounding buildings, matching brick and limestone details. 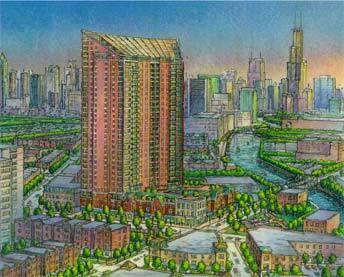 The tower is designed to reflect the nearby residential high rise buildings, as well as provide sweeping views of the City, lakefront, and surrounding neighborhood. Sonoc Architects provided site analysis and zoning review documents, schematic and design development drawings and final architectural illustrations for public review.